Flying back to Chicago, as the festival winds down and Park City sheds the last of its visiting journalists and producers and tourists, I’m left wishing yet again that I had time to talk with more of the movies myself. There were plenty of interesting films I never got around to writing about, including not one but two touching minor-key dramas about coping with the impending death of a loved one: Paddleton, featuring Mark Duplass and Ray Romano, which hits Netflix in a few weeks; and Awkwafina’s The Farewell, which looks very much like a viable prizewinner, maybe even the likeliest candidate to pick up the jury’s U.S. Dramatic award. Thankfully, Sundance always has a long tail. Which is to say, most of what played over the last week at America’s most prominent film festival will make its way to theaters or Netflix or HBO over the next year. The conversation will continue. To put a bow on the fest, here are my favorite films of Sundance 2019, all of which have been picked up for U.S. distribution. Consider it my own personal recap of the festival that was. The record scratches are implied. In the mountains of Colombia, teenage commandos hold an American engineer hostage. Answering only to war names, like Rambo and Bigfoot and Wolf, they’re one gun-toting arm of a rebel group called The Organization. But they’re also just kids—horny, confused, insecure kids, tasked with grave responsibilities they’re nowhere near emotionally mature enough to handle. Alejandro Landes’ gripping, pressure-cooker drama creates a whole social ecosystem, clarifying the relationships and personalities and interpersonal conflicts of its adolescent soldiers; we can quickly see their makeshift community as a warped, violent reflection of “ordinary” youth culture, and Landes ambivalently divides our sympathies once the platoon trudges into the thick, unforgiving foliage and their prisoner, played by Julianne Nicholson, makes a break for civilization. Propelled by a primal Mica Levi score and hallucinatory images of a war-torn natural world, Monos has the anarchic power of a Werner Herzog jungle odyssey. No offense to the festival, but I can’t totally believe I saw this thing at Sundance. It’s a Cannes movie all the way. I also can’t believe that one of the best movies of the fest came from the director of The Cloverfield Paradox. But while that Netflix boondoggle was an incoherent hodgepodge of other sci-fi flicks, Julius Onah’s deeply thorny psychodrama about stereotypes and expectations much more elegantly synthesizes its influences. Like Monos, it involves the horror of war waged by (and on) child soldiers, though that’s all backstory here—the nightmarish past of teenage Luce (Kelvin Harrison Jr. from It Comes At Night), who was rescued from an African warzone by an American couple years earlier and is now a beacon of academic success in suburban Virginia. Except his history teacher (Octavia Spencer) has some serious concerns about a paper he wrote and something even more serious she found in his locker. That the parents are played by Naomi Watts and Tim Roth is a bit of a tell—there are strong shades of Funny Games director Michael Haneke, thematic if not stylistic, in the film’s probing of upper-middle-class values. But I also saw a little of the great Iranian filmmaker Asghar Farhadi in the way J.C. Lee’s script, which he adapted from his own stage play, pivots on deception, on what some characters know and others don’t. Luce occasionally betrays its roots (it gets a little monologue-y here and there), but visually speaking, it never remotely resembles filmed theatre. The movie hinges on Harrison’s precision—the way he carefully modulates his tone and expression, transmitting coded emotions from behind a mask of overachiever charm. It’s a chilling, remarkable performance. So widely has digital supplanted celluloid that simply shooting a film on film can now provide it an instant exotic quality—especially here at Sundance, where too many movies have no texture to speak of. But there’s more than novelty in the grainy, ethereal visual splendor of this semi-autobiographical drama from British writer-director Joanna Hogg (Archipelago, Unrelated). Set in the 1980s, The Souvenir follows a young film student (Honor Swinton-Byrne, whose famous mother, Tilda Swinton, plays her onscreen mother here) through the ups and downs of her rocky relationship with a troubled government official (Tom Burke). Hogg lets the aching romance unfold across the years through illustrative glimpses and moments out of time, a creative soul emerging slowly from its smoldering wreckage. The Souvenir didn’t just make me miss celluloid. It made me miss film school, too—quite the achievement, that. Enter with caution, Babadook fans. Jennifer Kent’s follow-up to that genre milestone breaks in a different direction, away from supernatural scares (however metaphoric they may have been) and towards a deeper, uglier horror, the kind provoked by the savagery of an old world not so different from the new one. Even by the standards of Aussie Westerns, The Nightingale is exhaustingly brutal. But there’s a hard-won power to its vision of two lost souls—one a woman, the other an Aboriginal man—pushing back against their abusers, and finding a kinship in survival and endurance. Not every major movie is an easy sit. There are no scenes in The Report of Daniel Jones eating dinner or calling his parents or fighting with his girlfriend. 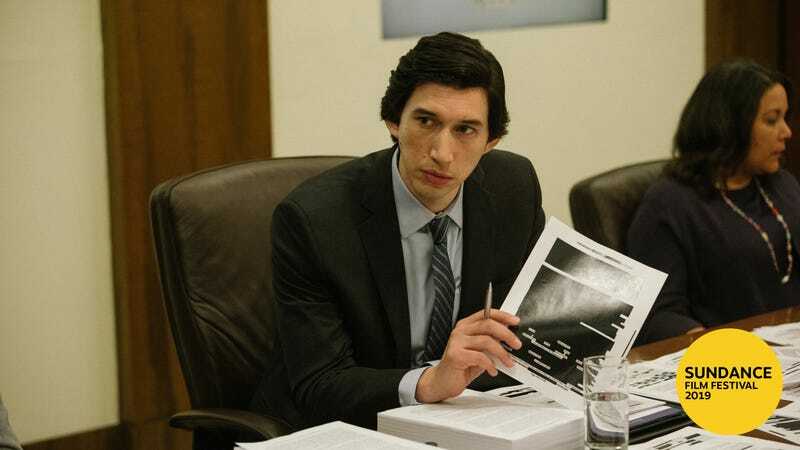 In fact, peeks into the personal life of the real-life investigator, played here by Adam Driver, are limited to a few shots of him jogging—and even those often transition straight into a load-bearing or expositional conversation. Like its main character, The Report is all business: a pure procedural about the five years Jones spent investigating the CIA’s Detention And Interrogation Program, and the subsequent attempts by both the agency and the White House to bury his findings. As a director, Scott Z. Burns lacks the flair of Steven Soderbergh, who produced the movie (and for whom he’s written a few scripts, like those for Contagion and The Informant!). But there’s an integrity to his refusal to gussy up the material; he’s solely interested in clearly, concisely conveying the importance of the investigation and the full scope of what it uncovered, almost as if his source material was the actual report. In that way, Burns does Jones proud: He’s made a movie as square and professional and ultimately noble as its main character—a portrait of American heroism as a job carefully, thoroughly done.